For decoders without motor regulator the type of incline can be set which will cause increasing or decreasing velocity commands. To be used in case of Delta-like decoders. The type of incline is ignored by locos with regulated motors (see Locos: SBT). This option is for oneway blocks only. The time a train should wait in the block can be set to the desired value for trains not running a schedule. 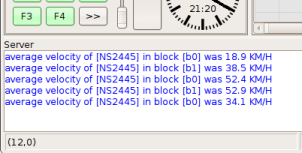 If the incoming train will wait depends also from the Block Type settings. Certain or all trains, depending on the combination of Block and Train Types, will wait in the block. The waiting time is set on a random basis within the time frame given from the Random Min. and Random Max. fields, respectively (see Wait details below). Certain or all trains, depending on the combination of Block and Train Types, will wait in the block. The wait time is set in the field Fixed of the Wait details (see below). Certain or all trains, depending on the combination of Block and Train Types, will wait in the block. The wait time is the Block wait time specified in the Loco Properties of each loco. Trains will not stop and wait in the block, if possible (requires a free next destination). Certain or all trains, depending on the combination of Block and Train Types, will stop in the block and change in the idle mode. Note: This option could impact Schedules Schedule or Tours Tour . Times for Random and Fixed waiting are set here. All time fields are in seconds. Random Min. and Random Max. together result in a time frame within which the waiting time will be in Random mode. Example: Random Min. = 10 and Random Max. = 60: Trains will wait at least 10 and a maximum of 60 seconds in the block. The selection determines for which entry side(s), the waiting option applies. (+) side the train waits only, if it arrives in the +side of the block, no waiting from the (-) side, etc. The average velocity in KMH is calculated by setting the measurement Distance between enter and in in millimeters, and Scale to 87 for H0, 120 for TT and 160 for N.
The calculated velocities are shown in the server window. Block Velocity Measurement will only be active in auto mode. Measurement is not possible with only an Enter2In event . See MVTrack for more information. See MVTrack Recording for more information. 1) If not defined differently with V_cru. This velocity will be used if a train arrives, triggering the enter event. For departing trains the velocity can be set to fit your requirements. This velocity is maintained until the next enter event. The maximal block speed in KmH. Loco speed remains unchanged if the actual speed is less than max. KmH. This is used to define if an approaching train, which wants to enter, matches the Type for this block. If it is set to Intercity and a Freight train is approaching, which does not find any alternative blocks, the Freight train would run through this block but if possible without waiting like a passenger train. The checkboxes are of type tri-state which can be used to disable wait for a type if set in the undetermined state. Note: If no type is selected, the block details settings will not be evaluated. If no special train type is desired, then the setting "Others" should be selected.